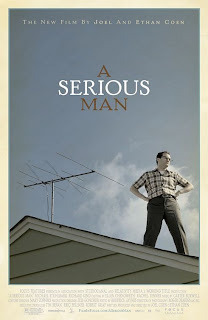 CINEMARINA: "A Serious Man" By Ethan and Joel Coen. "A Serious Man" By Ethan and Joel Coen. I would rate it *** (3 stars). It starts with a weird scene that has nothing to do with the movie. Apparently, the Coen Brother's new perfectly that it was "weird", but decided to put it as an introduction to the movie. The story about a Jewish man named Larry. He is in the process of divorcing his wife, who is having a love affair. His children are always whining and complaining, and his brother who doesn't have a place to live comes to share the couch. He goes to various trips to the Rabbi's to seek help, but can't ever get it. The movie ends out of nowhere (which usually I like), but this time, it had just not finished the overall message. Of course there were many funny scenes, especially when Larry's son is extremely high at his Bar-Mitvah. Well, that is what i though. And u? Where does the word/slang "DYKE" come from?